Nijmegen is verkozen tot European Green Capital 2018! We trappen dit bijzondere jaar af met Wondertuin: een driedaags festival van 19 t/m 21 januari 2018 dat bruist van duurzaamheid. 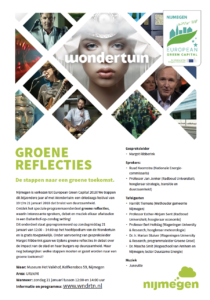 Ontdek het speciale programmaonderdeel groene reflecties, waarin interessante sprekers, debat en muziek elkaar afwisselen in een Buitenhof-op-zondag setting! Dit onderdeel staat geprogrammeerd op zondagmiddag 21 januari 2018 van 12:00 – 14:00 op het hoofdpodium van de Wondertuin en is gratis toegankelijk. Onder aanvoering van gespreksleider Margot Ribberink gaan we tijdens groene reflecties in debat over de impact van de stad en haar burgers op duurzaamheid. Maar nog belangrijker: welke stappen moeten er gezet worden naar een groene toekomst? I simply want to say I am just all new to blogs and definitely liked this web blog. Likely I’m want to bookmark your site . You really come with exceptional articles. With thanks for sharing your website. I just want to mention I’m new to weblog and seriously enjoyed you’re blog site. Probably I’m planning to bookmark your blog post . You actually have awesome articles. Bless you for sharing your blog site. I just want to mention I am just very new to weblog and actually savored this website. Almost certainly I’m planning to bookmark your blog post . You amazingly come with superb stories. Bless you for sharing your web-site. I simply want to say I am just beginner to weblog and definitely savored this page. Very likely I’m want to bookmark your blog . You definitely have excellent articles and reviews. Many thanks for sharing your web site. I really wanted to jot down a quick message to appreciate you for all of the awesome advice you are writing on this site. My considerable internet lookup has at the end of the day been paid with high-quality content to exchange with my pals. I would tell you that we readers actually are undoubtedly fortunate to be in a very good place with very many perfect individuals with beneficial secrets. I feel pretty lucky to have seen your entire webpage and look forward to plenty of more entertaining times reading here. Thank you again for a lot of things. I have been checking out many of your stories and i must say nice stuff. I will definitely bookmark your site. Good ¡V I should certainly pronounce, impressed with your site. I had no trouble navigating through all the tabs as well as related information ended up being truly simple to do to access. I recently found what I hoped for before you know it at all. Reasonably unusual. Is likely to appreciate it for those who add forums or anything, website theme . a tones way for your client to communicate. Excellent task.. I do consider all of the ideas you have introduced on your post. They are really convincing and can certainly work. Nonetheless, the posts are very short for newbies. May you please prolong them a little from next time? Thank you for the post.